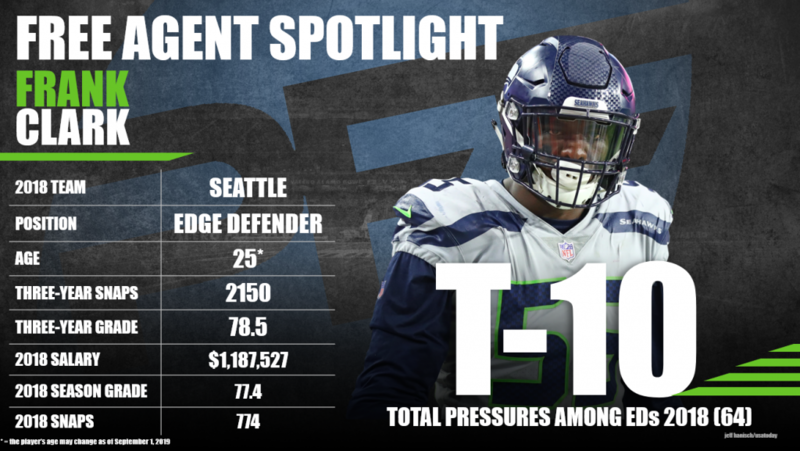 Seattle Seahawks’ edge defender Frank Clark is bound for a big pay-day after a standout 2018 season. He earned a career-high 77.4 overall grade across 774 defensive snaps this past year, logging 69 total pressures and 31 defensive stops in the process. Teams looking for an upgrade along the edge of their defense will jump at the opportunity to sign Clark if Seattle shows him the door. Subscribe to Pro Football Focus’ ELITE subscription to research Frank Clark’s grades, advanced stats, snaps and more in Premium Stats 2.0.